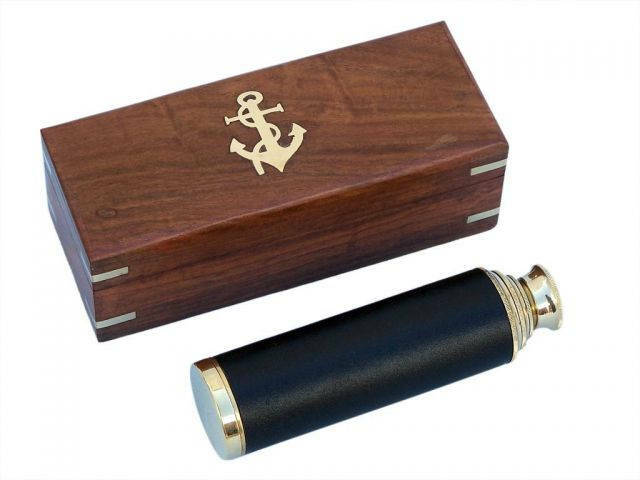 The Captain's Brass - Leather Spyglass Telescope 15" w/ Rosewood Box is a great gift for a nautical navigator in your family. The spyglass measures 15" when its four brass tubes, which are clear coated to protect the brass from tarnishing, are fully extended. The diameter of the objective lens is 30 mm. The spyglass is 5" when collapsed and features a stitched, leather wrapped handle. This spyglass also comes with a solid brass cap to protect the lens. Simply push in or pull out eyepiece to bring the image into clear focus. The brass spyglass telescope works by gathering light and sending it to a lens much as your own eye gathers light and sends a picture to your brain. Using various tube lengths, lenses, and mirrors, the brass nautical telescope comes in many sizes, capable of magnification by a few degrees to seeing vast distances in outer space. As the brass nautical telescope gathers light in order to present a clear, concise image, the larger the lens or mirror where the light is gathered, the more defined and detailed the image it will give. Light enters through the primary lens, is bent to a single focal point, and from there is absorbed by the lens of the eyepiece and magnified for your view. The primary lens does not change the image size, rather it is the lens or lenses of the eyepiece that produce the magnifying effect. Combining the detail gathering primary lens and the magnifying eyepiece lens, a clear, large image is produced. It is this combination of the focal length of the objective lens, or the length at which the light is focused to a point, and the eyepiece that create a basic brass nautical telescope. The classic ship telescope was a revolution in sailing, allowing sailors to see far off lands, more easily chart stars and create maps, and signal or fire upon other ships in the sea.